Having taught thousands of photography workshop participants over the last 16 years, I have come across certain mistakes that many wildlife photographers make, especially beginners. Below are six of the most common, with my tips on how to avoid them. Crouching Leopard. My Photo Safari group and I felt very privileged to be so incredibly close to this very relaxed leopard in Kenya recently. By leaving room in the direction the animal is facing, it makes the viewer wonder what it is looking at. One of the most common mistakes photographers make when photographing wildlife is not leaving room in the direction the animal is facing. By leaving room in that particular direction, it 'balances' the image and also makes the viewer think "I wonder where the animal is looking"? 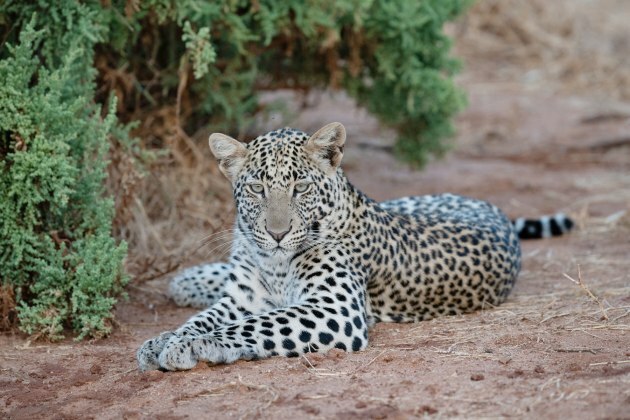 The image featured here of the crouching leopard is a good example. What is the leopard looking at? Is it a gazelle, about to be hunted? Basically, it leaves the viewer guessing and makes for a much more aesthetically-pleasing image. The same rule applies for leaving too much room behind an animal. This is known as 'wasted space' and doesn't make for great composition. Watching these three little elephants interact was such a joy. Photographing them at eye level as they played made for a much more pleasing image. Having judged many wildlife photography competitions over the years, I have seen some potentially-brilliant images ruined simply by the angle they were shot at. A common mistake made by photographers is to look straight down onto a subject. In the case of the image featured with the baby elephants playing, some of my safari participants were standing up in the vehicle we were in and photographing down over the top of them. I suggested they sit back down, rest a beanbag that was provided on the rail and place their camera/lens on the beanbag. It makes for a much more pleasant angle when, if possible, you are looking at eye level to your subject and the beanbag helps to stabilise your gear. Our Kenya Photo Safari Guide was brilliant at finding wildlife at close range for us. 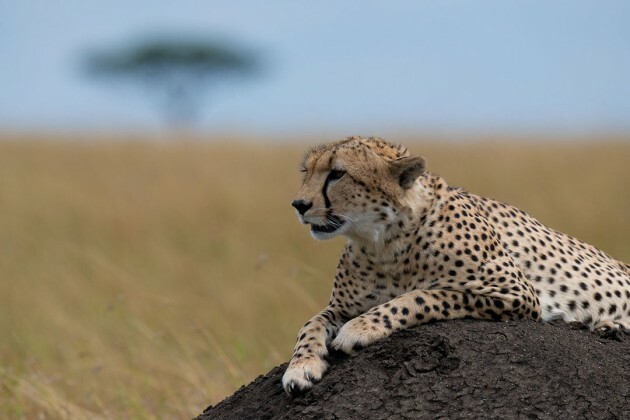 This Cheetah sitting on a termite mound was a great example, as it surveyed the land around looking for its next meal. Asking the guide to move his vehicle a tad meant that I was able to compose the tree where I wanted it, not sticking up from behind the cheetah's head. If I owned a dollar for every time I have seen beautiful images spoilt by unwanted subjects, such as trees or branches sticking up behind an animal's head, I would be a rich man :-) This error is a common one that many wildlife photographers will make. 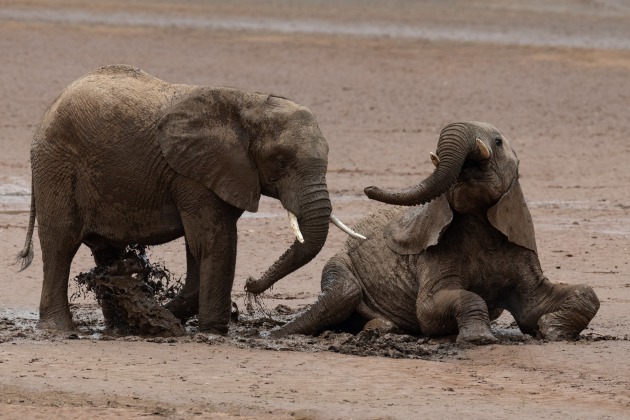 It is easy to get caught up in the 'excitement' of photographing wildlife, especially in places such as Africa, where the diversity and number of animals is endless, interactions can be breathtaking and often at incredibly close range. I recommend you look at your surroundings first and when an there is potential to take an interesting shot, try and line it up so that you don't have distractions in the background. In the case of the image featured with the cheetah on the termite mound, the Acacia tree was sticking right up the back of the cheetah's head. I asked our safari guide to move our vehicle a few metres, so that I could balance the tree opposite to where the animal was sitting. The guides I have used over the years I have presented safaris in Africa have all been very accommodating. They don't mind you asking them to move their vehicles to get the best possible background or lighting conditions. Recently, during my Kenyan Photo Safari, our guides were all very experienced and knew exactly where we needed to be, without me having to ask each time. Definitely an advantage! By using continuous focus, combined with 'burst' mode, I was able to capture this beautiful roller in mid-flight, in the Serengeti, Kenya. 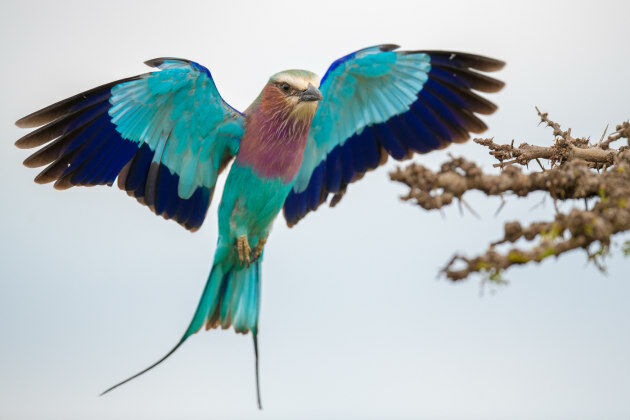 When it comes to photographing flying birds such as this Lilac-breasted Roller, a common error photographers make is to try and track the subject using single focus on the auto focus setting. It is necessary to use 'Continuous Focus' (AI Servo for Canon users) and keep your finger half-depressed on the shutter button, tracking the bird as it is flying. I also recommend using continuous shot or burst mode. That way you will capture the whole sequence of behaviour, choosing the one that works the best. For those that have it available as an option on their camera, back-button focus is a great feature when trying to focus on moving wildlife, as your 'strike rate' of good shots will generally improve. Waiting longer than most other vehicles nearby, my Photo Safari group were rewarded by seeing and photographing these adorable lion cub siblings as they wrestled. Patience is very important when photographing wildlife behaviour. One mistake some wildlife photographers make when trying to photograph wildlife interactions and behaviors, is to become impatient. I have been photographing wildlife behaviour for over 22 years and without patience, I wouldn't have achieved a good portion of the images I have in my image library. People often comment how 'lucky' I am to have such a large portfolio of wildlife behaviour images, but without patience, as well as using the correct camera settings, many of the images wouldn't have been possible. Here is a good example. On the third day of our recent Kenya Photo Safari, my group and I were told that there was a pride of female lions with cubs, resting under a tree. We drove to the spot and, as described, the lion pride was resting and all were quite sedate. I could sense that my group were ready to move on to something else, but suggested we wait a bit longer. I have often been rewarded for my patience in the past, so we gave it a go. 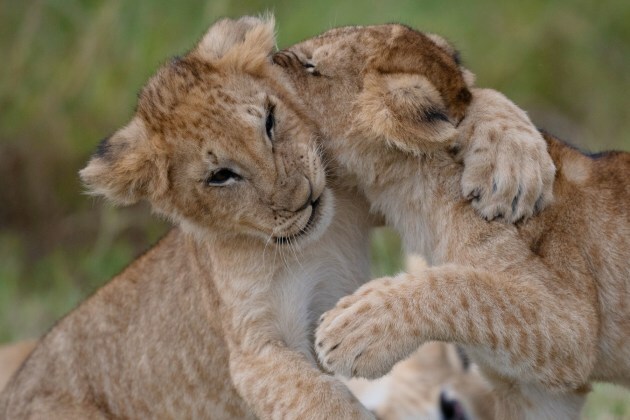 Not ten minutes later, two sibling lion cubs got up and started playing! We all ended up with lots of different images of them playing, the one featured being one of them. 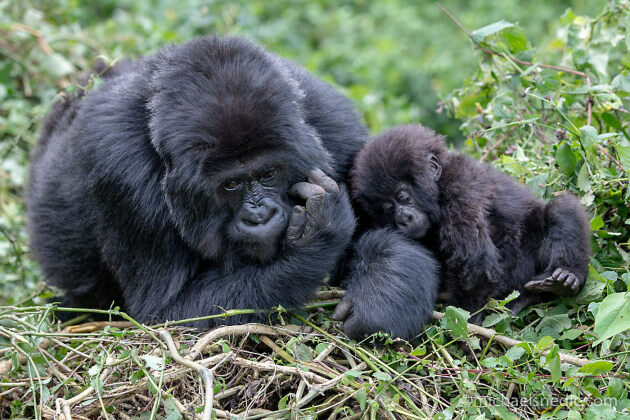 Our visit to see and photograph the Mountain Gorillas in Rwanda was a life experience none of my group will ever forget. By moving around at different angles, I was able to get this image without the distraction of branches, leaves or grass. Following our Kenyan Photo Safari, I took my group on a second safari, this time to the Volcanoes National Park in Rwanda, to see and photograph the incredible Mountain Gorillas. We had two visits and on the second day, were treated to this beautiful scene of mother with its baby. The problem was that there were out-of-focus plants in front of the baby's body, which made for a huge distraction to the image. A common error photographers make is to get so excited by the scene in front of them that they forget about distracting objects in the foreground. They often only find out when they have downloaded their images onto a computer and by then, it's too late to come back and retake the image! I always mention to photography workshop participants that when its convenient, revise some of your images on the back of the camera's LCD screen. If you notice images with distractions, retake the images there and then, simply by changing your position in many cases. About the author: Michael Snedic is one of Australia's most experienced and published professional wildlife photographers and tutors and has been presenting photography workshops across Australia and the world for 16 years! He is the owner and operator of WildNature Photo Expeditions, which specialises in Photo Workshops, Safaris and Expeditions to destinations across the globe including Africa (Kenya and Mountain Gorillas in Rwanda), Antarctica, Arctic, Sub-Antarctic and the Russian Far East! Australian destinations include Lord Howe Island, Tasmania, Western Australia, Kangaroo Island and Lamington National Park, in Queensland. Visit WildNature Photo Expeditions HERE for more details.